2nd Annual Random Summer Competition: Get Caught Reading, & Win! It's summer.....not that it is always that easy to tell in the UK. And it is time for a Random Summer Competition!! 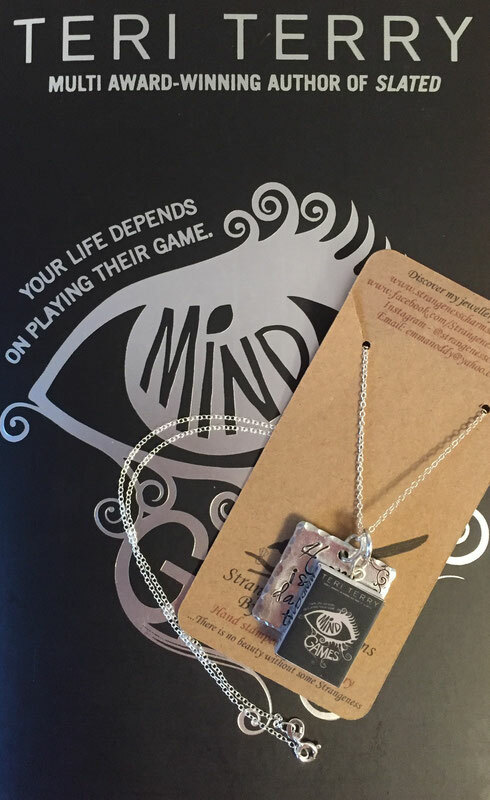 A signed copy of Mind Games, and a unique necklace, as shown! 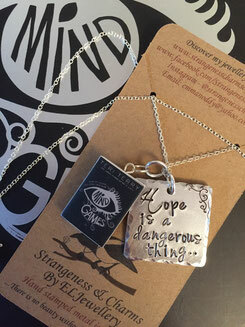 This is a bit more of a close up, where you can see there is a mini book of Mind Games, and a hand stamped message - a warning from me, the author, to the main character Luna. Not that she'll listen. I had it made specially - there are only two like this, and the other one is mine. Get caught reading one of my books in an exotic summer holiday locale - if you go on exotic summer holidays. If, like me, your summer will be more spend in the back garden instead of scaling Everest or swimming in the Caribbean, use some imagination: have your photo taken in an unusual interesting place in your own neighbourhood. the winner's name will be posted on my blog, Facebook page, Twitter and Instagram, and has a week to message me with their details before another winner will be chosen. But what I mean more was this: why am I having a Mind Games based giveaway now, when Book of Lies just came out a few months ago? I meant to have a Mind Games giveaway with this necklace when Mind Games came out last year, but...well...I temporarily forgot where I put the necklace. I was tidying up and I found it! I'm really excited about a few awards Mind Games is short listed for; who knows, it might even win something! Hi! I really love your books and it's amazing to be able to participate in this competition. I live in Portugal só it's almost impossible to meet you. And thank you for giving this opportunity to win such amazing things. I hope to one day have the chance to meet you! I love the look of the necklace and also have the singed copy of the book I met you at the Cheshire Book Quiz. Hello, My name is Chelsea. I'm Indonesian. I just read your Slated trilogy and i really really fall in love with it. May God bless you! Hello, my name is Kara. I am 17. I am from UK, West Yorkshire. When I first read the Slated books I final felt I was understood. It was amazing trilogy to read. And I read them nearly every 2 months. I can't wait to read more of your books. I got the trilogy 2014 by my grandma and then got them in 2015 at Christmas by my mum as I wanted the books there for both of my parents houses to read at any time. It would be brilliant to win something. I love the books and the designs. I love all the characters. It happens to be winter for me here and school time so I will not be reading in an exotic summer location and will be at home. And since I am supposed to be studying, I am procrastinating by entering this. Anyway I absolutely loved Mind Games and my heart literally died at the end and I'm meaning to read the Slated Trilogy but I have an extremely long to read list. Here are the links because why not enter twice if you got the time? First photo is an edit that I made and the third photo on the left I photographed because I basically just spend majority of my time on the computer and internet anyways which is basically what I would do if it were the holidays. I have entered the competition and am dying to know the result. When will it be announced please? Soon, I promise! by the end of the weekend at the latest, and probably even sooner than that.